I remember learning about adjectives as a kid, having to pick the ones that described me. “Creative” was always one of adjectives ones I chose – and like kids everywhere, I never stopped creating. I directed my siblings in plays, brought secret societies to life in living room forts, choreographed Disney tunes and filled notebooks with the adventures of cartoon bunnies. People were – and often still are – always praising my creativity. I didn’t end up working for a creative company or selling my photographs, I didn’t publish poetry or even design logos. I downplayed the role of creativity in my life and became intimidated by the people who were actually making money off their Creativity. When people called me creative, I shrugged it off. Sure, I wrote spoken word poetry, designed multidisciplinary experiential programs, took photographs, painted, blogged, organized theme parties, cooked feasts, founded social groups, nurtured gardens, developed innovative lesson plans but…. Yesterday morning I biked down to Liberty Village to be among the city’s real Creatives. For a few years, Toronto has hosted Creative Mornings – a free monthly breakfast lecture series for the creative community. Whenever possible, I attend these talks for the spark of inspiration that always comes from opening my mind to someone who is in a totally different field than mine. What I will get out of it is always a mystery, but I have never been disappointed. Every time I attend a Creative Mornings talk, I sit quietly and dash as soon as it ends. I feel like an impostor. Because, you know – not a Creative. I don’t even have tattoos or a funky haircut. 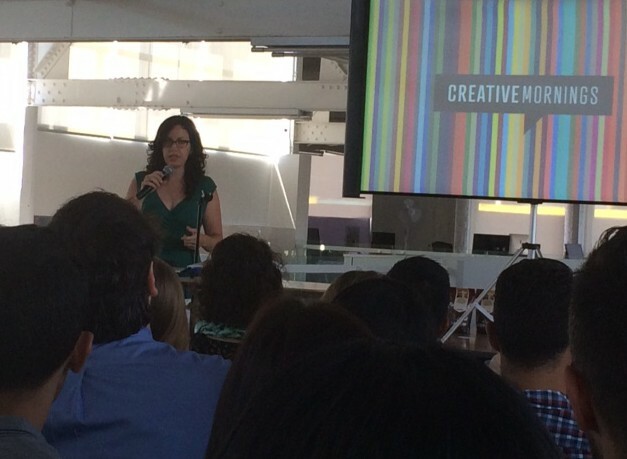 Yesterday’s Creative Mornings talk – featuring Yvonne Bambrick – was the first time I actually felt like I belonged. Bambrick spoke about her ‘creative journey’ as a community organizer, event coordinator, and cycling advocate. Wait a minute…those aren’t Creative jobs. OK so Yvonne is also a photographer (like me, she wears many, many hats), but that’s not at all what she highlighted in her talk. In fact, when she went over the things she has learned over the course of her ever-evolving career, the number one lesson was about broadening the definition of creativity. Hearing this, I was suddenly very aware of how differently I was behaving at this morning’s event. Yet another outer demonstration of the inner shift that has been taking place over the last few months. I was talking to everyone around me, not quietly eating my everything bagel – seeds in my teeth be damned! I engaged in the conversation on twitter. I was no longer self-conscious about being called out as a non-Creative interloper. I was one of the last people to leave. I realized that lately I am more comfortable considering myself creative. I approached Yvonne when it was all done to thank her for putting into words what I’ve been feeling for the last few months. “I am more creative than I thought,” she remarked during her talk, as she spoke about rethinking the definition of ‘creative skills’ to encompass all of the ways she has problem solved, integrated and innovated in her work and her life. Creativity is not a gift that is only given to a special few. It is an innate human trait that we can all cultivate. Some have to work harder than others, but that says less about your innate capacity for creativity than it does about your fears, self-judgments and the mental habits that keep you safe. 1. Broaden your perception of what it means to be creative. Think about how you express yourself in your daily life. What small choices do you make every day that dictate how you present yourself to the world? 2. Own any novel patterns, products, concepts, or processes that you have put out there as your creative oeuvre. Remember that creativity does not equal art. How have you combined interesting ingredients to come up with something new? 3. Do you allow yourself to daydream? If not, give yourself permission to try it ASAP. Go for a walk or just lie around on the couch. Then pay attention to your daydreams and notice where your mind goes when you are idle. 4. Creativity is often driven by a sense of purpose. Think about ways that you have tapped into your values and worked with a mission to solve a problem – no matter how big or small. 5. Examine your relationship with change. When have you made a change, embraced a change, reacted to change, thrived on change? Reflect on the times in your life when you have made positive changes of any size. What unnecessary boundaries have you broken? What perceptions have you challenged? 6. Think about times that you have harnessed inspiration from an unexpected source. Whether it is nature, another person, a piece of music, or even your own failure, creativity comes when we can recognize learning opportunities everywhere and grow from unlikely inspiration. What creative ways have you translated the random things that inspire you into your life and work? Reframing it this way, I can once again own my creativity as an essential part of my being. If you look at your own life through this broadened lens, I bet you will see yourself as creative as well. You will recognize the fact that you create prolifically on a daily basis. And I’d also bet that the more you own your creativity, the more creative you will become. Today I am alone at my cottage having a lazy, rainy summer day. How have I been creative today? 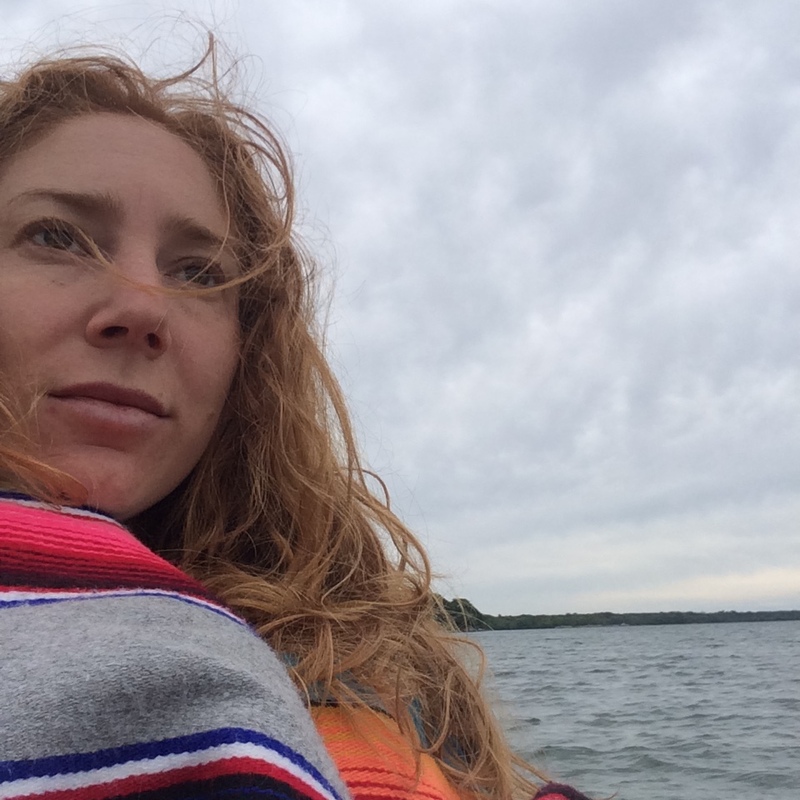 I sat on the dock and daydreamed while I watched a bass hovering over its eggs, and then daydreamed some more while weeding my garden. I sliced asparagus differently than I ever had for my omelette. I pickled garlic scapes and cooked rhubarb with rose water. I picked and arranged a sumptuous bouquet of peonies and wildflowers. And I wrote this post. If you’re looking for an undeniable reminder of your creative self, come to my Wildness Weekend: A Co-Created Retreat for Heart Centred Female Innovators. Your wild self can’t help but create – it is her birthright and her essence. Info and registration here.